60 grammar, punctuation, vocabulary and spelling activities. Perfect for KS2 SATs preparation. 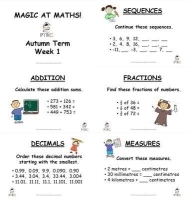 Year 5/6 Great at Grammar - Autumn Term Pack - newly updated to meet the demands of the New National Curriculum. With this termly pack you will receive 12 weeks of activities. Each week there are 5 activities and all 12 weeks will be emailed to you upon purchase.